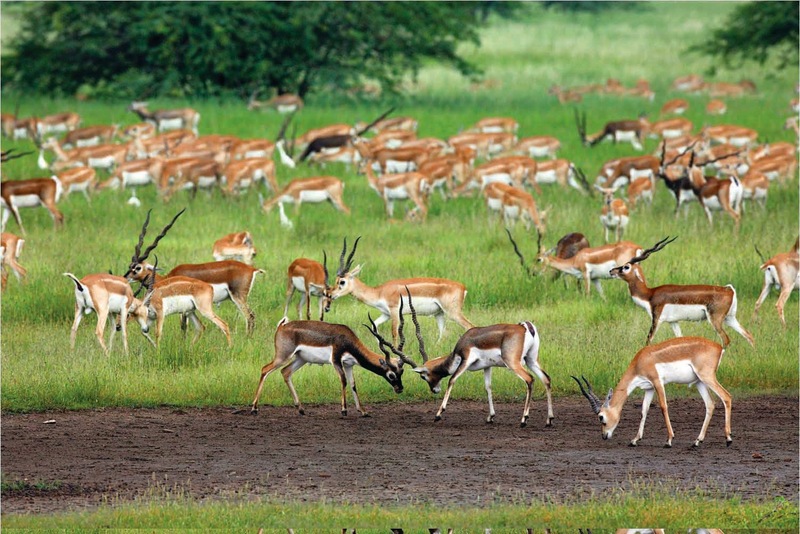 Ever imagined of remain surrounded by hundreds of majestic Blackbucks roaming around you in a lush green meadow. Yes, one can take in the beauty of this rare species of antelopes in Balipadar-Bhentnoi area, located at a distance of around 165 kilometres down the south from Bhubaneswar. 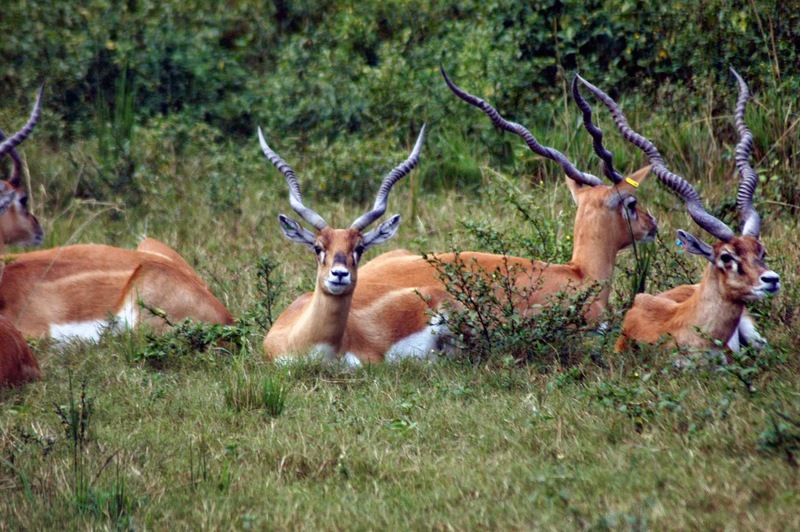 In the Bhentnoi-Balipadar and adjacent areas in Ganjam District comprising of about 70 villages of Aska, Buguda and Kodala forest ranges in Ganjam district, Blackbucks are protected religiously by the locals for several generations who venerate Blackbucks as harbingers of rain. As per The locals, more than a century ago the area was suffering through drought that broke with the appearance of a small group of Blackbuck, as black rain clouds followed the black antelopes to break the long spell of dearth. The incident had coincided Blackbucks with rain and people started protecting these animals rigidly for generations. In 1981 a local leader Chandramani Dora and British ‘Green Saheb’ had took major initiatives to protect this species by prohibiting killing of Blackbucks. The villagers do not kill the animal even if it strays into the fields and graze their crop. It is believed that the presence of Blackbuck in the paddy fields brings prosperity and killing brings bad fate. This initiated a new relation between the locals and Blackbucks resulting in cordial coexistence and the antelopes accepted the new forest section near human habitats, their new domicile. Seeing human nearby, they do not ran away. You can put your belongings at nearby rest house and set out to enjoy one of the thrilling experiences-‘Blackbuck sightings’. The fascinating vista of hundreds of Blackbucks in a lush green field washed in golden rays of setting sun in the meadows has the power of enchant anybody. Even an early dawn doze is the best time to dedicate to bird and Blackbuck sighting in the velvety green meadow covered with dew drops, sparking like diamonds in soft rays of sun trying in vain to rein the Blackbucks mesmerizes the beholder to treasure the precious sight lifelong. Blackbuck or ‘Krishnasar Mriga’ is an antelope species found in large tracts of India. With a speed of 80 km/hr, it is considered as one of the fastest of all terrestrial animals. 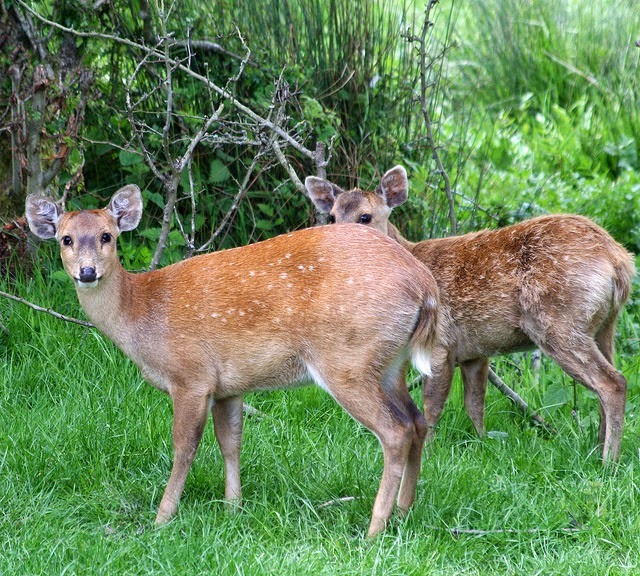 Male bucks are of black and white and long twisted horns whereas, female bucks and fawn are of golden bronze white colour with no horns. 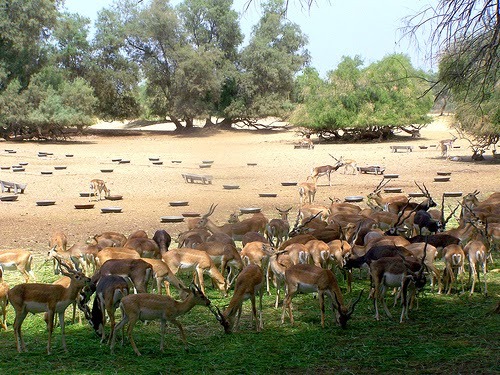 This endangered species of antelopes has increased their number to spread out in the area. Blackbuck census report-2004 indicates a 42% increase in the Blackbuck population in three Forest ranges, namely Buguda, Aska and Khallikote, over the last count(1998 census), and with a 56% Blackbuck population in the area is a great sign for wildlife conservation initiatives. All possible way to safe guard the interest of local farmers along with providing a safe shelter to Blackbucks are taken. It was remarkable to see the interest among local of Bhetnoi in conservation of Blackbucks. Located at a distance of around 165 km in south from Bhubaneswar, Bhetnoi in Ganjam District is easily accessible by road and railways. Bus route is straight where as by train one needs to reach Brahmpur and take taxi to cover 50kms to Bhetnoi. There are lodging and boarding facilities at Aska which is only 12 km away from Bhetonoi. ‘Tara Tarini’, one of the famous ‘Shakti Peetha’ of Odisha is only at a distance of 30 km where as the ‘Ghoda hada Dam’, popular for its scenic beauty is only 25kms from Bhetnoi and considered as must visit places to be covered if you ever plan for Bhetnoi, only if you managed to break out of the magical spell of Blackbucks.